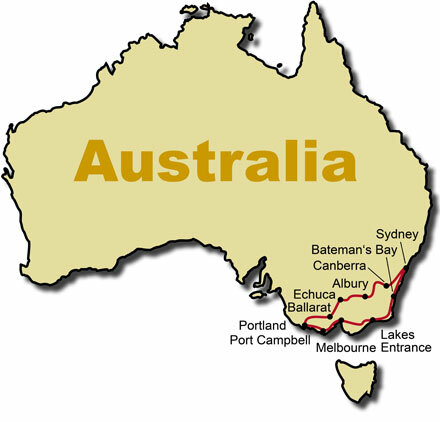 The 11 day KeaRider Down Under motorcycle tour through Australia will take you through the states of Victoria and New South Wales. You will get to know the vibrant cities Melbourne and Sydney and discover special landscapes such as the Great Ocean Road on the south coast of Australia, the Murray River and the wine-growing areas of Routherglen. On endless highways you can speed along. Don't forget in Australia there is only left-handed traffic! Other highlights on this road trip are an optional harbor cruise in Sydney with dinner and a ride with the steamboat on the Murray River. Finally, full of new impressions, you arrive back in Melbourne. After an individual journey, your motorcycle tour begins in the beautiful metropolis of Melbourne in the south of Australia, where you head off to the direction of Great Ocean Road and see among other things the Twelve Apostles. On the Great Ocean Road you will head west and enjoy the unique nature of this coastal road. Maybe even see whales in the wild! Today we head inland and visit the gold mining town Souvereign Hill which end of the 19th century is a reminiscent of the gold rush. Accommodation is in Ballarat. Relaxed cruising on the highway towards the Murray River is on the agenda - Australia is big and so are the distances. In the late afternoon, you will reach Echuca. This morning, you can take a boat trip on Australia's longest river, the Murray River before you cross over the Lake Mulwala to Routherglen, where Australia's delicious wines can be found. On this day, Canberra is on the program, the modern capital, which was built halfway between Melbourne and Sydney. From Canberra you can cruise to the freeway to Sydney, Australia's largest and most beautiful city. On a harbor cruise, you can see the famous opera and the Sydney Harbour Bridge up close. This day is at your free disposal. We will gladly help in buying tickets for the Opera or proposals for other activities. Along the coast, you will return via the Princess Highway 1 on the long journey back to Melbourne. Visit the Bendarah State forest and spend the night at Bateman's Bay. Enjoy the picturesque rough coastal scenery on the way to Tathra before you reach the next destination of Lakes Entrance in the afternoon. Your last stage leads you today on the Princess Highway 1 back to Melbourne and starting your individual journey back home.